Today inspiration comes from two news items. The former concerns the payment of tens of thousands euros by Silvio Berlusconi to Anna Palumbo, Noemi Letizia’s mother. 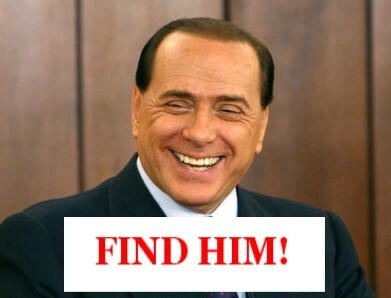 I already imagine the comments of Berlusconi’s fans: "So what? He’s rich, he’s got the money and he does what he wants." He’s rich, he’s got the money and he does what he wants. The latter news I wish to comment is this: in Italy, in December, the percentage of unemployed youth aged 15 to 24 years has reached a new record, 29%. Since I have now accepted the fact that our premier is rich, he’s got money and he does what he wants, I will not be here doing the moral guy. I just want to advise that 29% unemployed people. Well, not everybody, only the adult part of them. I do not want to do the moral guy, but I still have some values. Being honest, I am not referring just to adults: only the girls and not all. Let's say… the hot girls. Are you a young girl with important forms? Cannot find a job but you have so much love to offer? Do you want to get money quickly by exploiting your talents? Above all, have you enough stomach for close your nose and turn a blind eye… well, indeed both? The News: Premier's secret accounts: money to the mother of Noemi Letizia.